The road to the EURO 2016 started in the worst possible way for the Portuguese National Team. The "Selecção" was beaten at home by Albania by 0-1, in a game where the Portuguese Team couldn't count with Cristiano Ronaldo, who is still recovering from his injury in Madrid. Nothing seems to have changed much for Portugal since they got eliminated from the 2014 FIFA World Cup last summer. 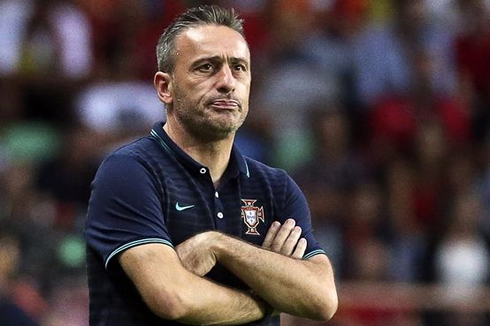 Paulo Bento's men were surprised at home against Albania this Sunday night by 0-1, as they allowed their visitors to come to Aveiro and steal the first 3 points in dispute in the EURO 2016 qualification stage. With Cristiano Ronaldo unavailable for this game, no one else within the Portuguese Team was able to step up their own game and make the difference on the pitch. Albania struck the decisive blow short after the break, with Bekim Balaj scoring the only goal of the game. Portugal will have a chance to redeem themselves from this unexpected upset right next month though, as they'll be visiting Denmark on October 14. As if losing at home against Albania wasn't shocking enough, the hard truth is Portugal never looked as strong as they are supposed to be and the final result has to be regarded as a fair outcome. Paulo Bento brought a few changes to the starting eleven since their last game in this summer's World Cup, but none of them seems to have produced the desired effect. Rui Patrício kept his spot in Portugal's goal and there wasn't much he could have done to avoid Albania's goal in the second half. The back-four was formed by Real Madrid's Fábio Coentrão on the left, João Pereira on the right, while Pepe and Ricardo Costa were chosen to team up and defend the more central areas. Portugal's midfield was left to Manchester United's summer target, William Carvalho, André Gomes and João Moutinho. When these three choices were announced, Bento immediately showed he had no problems in finally leaving Miguel Veloso and Raúl Meireles on the bench, two players who have been regular starters over the past few years in the Selecção. The attack was probably one of Portugal's weakest points last night. Without Cristiano Ronaldo around, Bento had to turn to the likes of Nani (captain), Vieirinha and Éder. None of them really managed to put out the intensity demanded for this game and the lack of quality in the last third of the pitch was definitely one of the reasons why Portugal struggled so much against a quite poor Albania side this Sunday night. The only goal in this match came in just 6 minutes after the game had resumed for its second half. It all happened through one of the visitors' few attacks last night, when Albania's midfielder Odise Roshi dribbled Ricardo Costa close to the right sideline and sent in a well-weighted cross into the heart of Portugal's box. Waiting for it was Bekim Balaj, who had just escaped Pepe's marking in order to get himself the space he needed to score the winning goal from a flawless volley with his right-foot. A truly great finish from the Slavia Praga forward. Cristiano Ronaldo next game for Real Madrid will be against Atletico Madrid, for the third fixture of La Liga, on September 13. In the meantime, the several national teams will stay enter the field over the next days and you can watch Real Madrid vs Atletico Madrid, Spain vs Macedonia, Switzerland vs England, Norway vs Italy, and Czech Republic vs Netherlands, all matches provided from our football live pages.